Cebu is one of the most diverse and unique provinces in the Philippines. Its capital, Cebu city, is the oldest city in the country and home to many historic sites and museums. The main island is surrounded by no less than 167 smaller islands and islets, So there is also no shortage of beautiful beaches and luxury resorts for those in search of leisure. Our travel agency offers fully personalized packages for your Cebu vacation. Choose one of our pre-made Cebu holiday packages featured below, or create your own travel plan. You can easily set your base at Cebu city or nearby Mactan island, and take all day tours from there. Alternatively, you could also book overnight tour packages to all the stunning locations nearby. Read below for a detailed guide, and contact us to help you build the perfect Cebu vacation package. All packages come with airfare, transfers, and your choice of accommodation. We can provide a personal tour guide, or you can choose to join one of our organized day tours instead. Discounts and promotions are of course available for families and large groups. Browse through the packages below and add the ones you like to your cart. For a more detailed itinerary, just click on each. Cebu, and especially Mactan, are one of the best places in the Philippines for a family vacation. 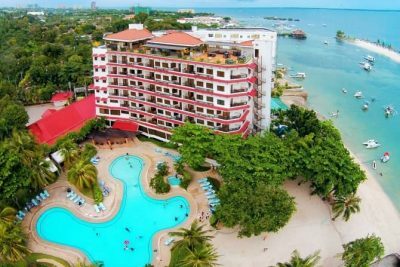 Our all inclusive Cebu package includes stays at 5 star beach resorts and access to all the best day tours and attractions. We also recommend you combine these packages with other locations, and let us help you plan your entire holiday. Cebu is the gateway to other amazing destinations such as Boracay, Palawan, Bohol and Siquijor. We promise to save you both time and money – while providing the dream vacation you deserve. Read below for more information about our combo packages, or click the inquiry button and we’ll help you plan your whole trip. 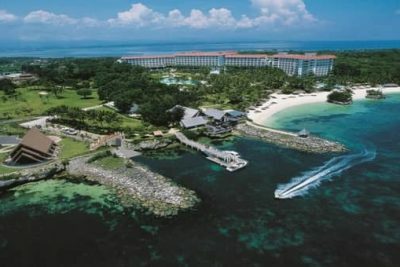 Mactan island is where you will find most all-inclusive 5-star hotels and beach resorts. The island is a 30-40 minute drive from the city and it is also where the airport is. In the City itself there is everything from luxury hotels to budget hostels, so it’s easier to find cheap rates. The main benefit of staying at the city itself is undoubtedly the price. 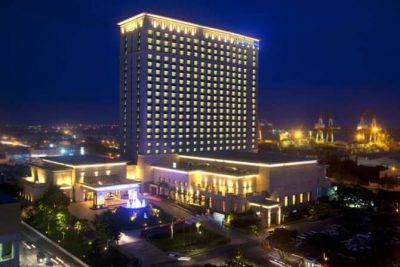 You can find rooms at world class 5 star hotels for less than 100$ a night. It will also make it easier to go on day tours outside the city to places like Oslob or Kawasan Falls for example – you’ll save the 30 minutes drive in the morning from Mactan. Nightlife in Cebu city is also substantially better, but of course the trade-off is sleeping in a busy city – with no beaches and a lot of traffic and noise. Our agency offers the best deals and help you find the best places to stay on your Cebu getaway. Each of the hotels and resorts featured here have been personally reviewed and scrutinized by our experts. We only present the best resorts, guaranteed to meet your expectations and ensure that you have the best vacation ever. 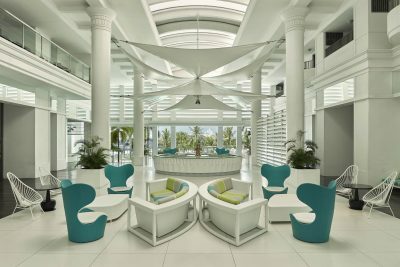 Since the level of service varies between different all inclusive resorts in Cebu, if that’s what you are looking for it’s best you just contact us directly. Those who wish to stay overnight outside the city are welcomed to do so. 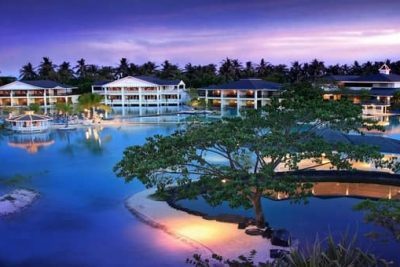 We work with fantastic resorts all around Cebu island. Most of these destinations are easily reached as day tours from the city itself, but even a single night can truly enhance your experience at each. 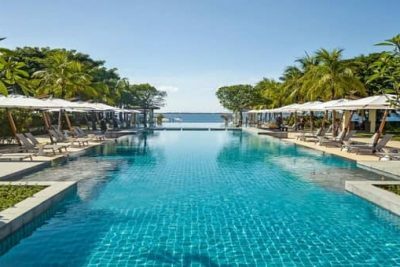 Read below for a detailed guide for each attraction, and a link to its review page – where you can pick the best hotel and add it to your Cebu wishlist. Flights : Mactan airport is the 2nd busiest in the country, so getting to many different places is simple. Flight from Cebu to Manila is 1 hour and 20 minutes and there are over 30 flights each day. Ferry : Cebu city has the largest port in the Philippines so going to and from the island is no hassle. If you are coming from nearby destinations like Bohol, then a fast ferry is a better alternative to airfare. For other nearby destinations like Boracay, Negros and Squijor, it is best to contact us so we can give you the best options possible for you. Getting around : We suggest taking a taxi or bus from Mactan airport to the city. 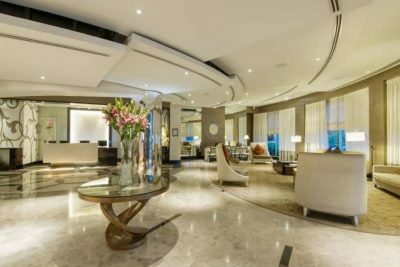 If you book one of our hotels, we’ll arrange free airport pickup. Cebu Island is quite big and going to more beautiful and remote places outside the city can be challenging. Best time to visit : Summer is between March and May, and temperatures can reach 40 degrees. The rainy season starts at July, but there aren’t many typhoons compared to other regions of the country. Cebu is best during January and February – a perfect mix of sunny days and cool evenings. Nightlife : Not much outside of Cebu city, where most of the action focuses around Mango square. Local festivals and holidays : the most famous festival is the Sinulog festival, held on the 3rd Sunday of January – the city is filled with visitors dancing in the street in a mardi-gras-like atmosphere. Sinulog is one of the most popular festivals in the entire country so expect loads of tourists. The Kadaugan sa Mactan (April 22 – April 27) is a commemoration of the historic battle between Magellan and the famous chieftain Lapu-Lapu – a week full of music and fun. What to do in Cebu? All tours found below can be added to your cart and booked as day tours in your Cebu itinerary. We can easily help you combine all of them into a complete travel package. All attractions and locations are available from your hotel in Cebu city or Mactan. We will arrange hotel pickup for you, and help plan your entire itinerary. Since you can easily spend a few days at each location, we offer below a quick overview for each. That way, you can decide which things you’d like to try and how much time you’d like to devote to each. Once you have some idea of how your Cebu holiday would look like – we can help you fine-tune everything and build the perfect vacation package. As the oldest city in the Philippines, Cebu offers a one of a kind mixture of local and colonial heritage. The “Queen city of the south” is full of historic monuments and temples. These sites offer a great chance to learn more about Filipino culture and history. The Basilica del Santo Niño (Basilica of the Holy Child) is Cebu’s most famous landmark. The Basilica is a large, ancient church whose roots trace back to the 16th century. It holds the famous statue of the holy child – the oldest religious relic in the country. Just a few minutes walk, lies Magellan’s cross – a large wooden cross given to the locals by the Portuguese conquistador to mark their conversion to Christianity. The Cebu Metropolitan Cathedral is another beautiful landmark from the colonial era and the birthplace of Catholicism in Asia. The Sugbo Museum consists of 4 beautiful Spanish-era buildings made of coral stones containing numerous historic artifacts. Those who are staying at one of Mactan’s beach resorts, should take the time and visit Mactan shrine. The shrine honors local chieftain Lapu-Lapu who defended the island in 1521 against Magellan’s troops when they first landed. 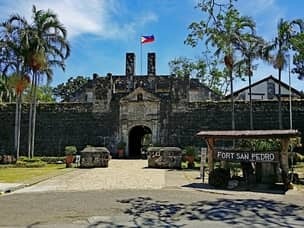 Other noteworthy landmarks include Fort San Pedro – an old Spanish fort, now converted into a museum displaying the treasures retrieved from the sunken San Diego galleon. The Casa Gorordo Museum is a well preserved colonial mansion. The Heritage of Cebu monument is a collection of statues made by local artist Eduardo Castrillo in 1997, to celebrate the province’s rich history. 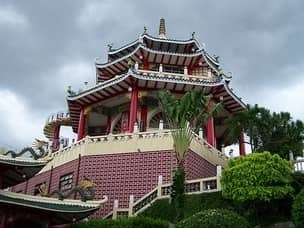 To round up your tour, you could visit the City’s Taoist temple and learn more about Cebu’s deep Chinese roots. At night, the city transformers into one of the best nightlife locations in the Philippines. The main attraction is Mango Square – a large area full of restaurants, bars and nightclubs. While Mango square is better for westereners, you could also visit the IT park compound (10 minutes drive) for a more authentic experience with the locals. If you are feeling adventurous, you could also drop by Sky experience adventure, located in Cebu’s tallest tower (140m) – the Crown Regency Cebu. There you’ll enjoy a thrilling adventure without even needing to leave the city. If you are not afraid of heights then you will enjoy the amazing view from the top of the building and try their Edge Coaster where you will be literally at the edge of the 38th floor. You can easily do these city tours all by yourself, and we will be happy to offer free advice and help you plan it. However, we strongly advise you simply book it through us as part of your Cebu package. For a small fee you’ll get to enjoy a private, guided tour of the city and all of its attractions. Our expert guides provide significant value to each tour, as well as help customize it to your exact wishes. This will ensure you spend your time wisely, and only visit places you are really interested in. Mactan is the most popular jump-off point for island hopping tours since it is surrounded by smaller islands and marine sanctuaries. There are 6 major islands – Olango, Gilutungan, Nalusuan, Caohagan, Hilutungan and Pandanon. The islands are great diving and snorkeling spots offering an amazing combination of colorful marine life and white sandy beaches. There are plenty more smaller islands and secluded beaches, which are perfect for a relaxing day away from the crowds. Island hopping tours can be booked directly through your resort at no additional cost, as long as youv’e purchased one of our all inclusive packages. Otherwise, simply contact us and we’ll help build the right itinerary to make sure you are satisfied and have a great time. Mactan is also a great place to try out scuba diving for the first time. If you are not sure if diving is for you, this is the place to find out before you continue with your vacation and visit smaller islands. We work with established dive clubs who have been there for more than 10 years now, and they are all owned by foreigners and adhere to the highest standards. Apart for fun dives for complete beginners, you can also get certified here, or advance an existing certificate. This is a great idea if you plan to visit Moalboal or Malapascua later on – so you can arrive there with all the necessary knowledge. All these make Mactan the perfect choice for families and couples, who prefer luxury treatment over the city’s nightlife. Accommodation prices are quite similar to Boracay’s and the selection is very wide. 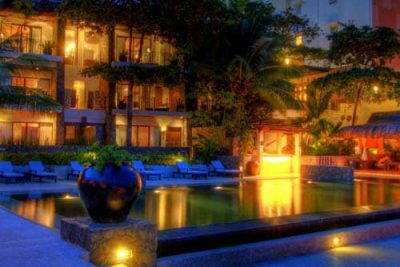 Typically a 5 star resort will cost around 200 USD per night, while mid range hotels go for as low as 40. Group and family discounts are available, especially during the low season. Since Mactan Island is only 40 minutes drive away from Cebu City, all day tours can be taken from there as well. In some cases, it’ll just mean you have to wake up a bit earlier. 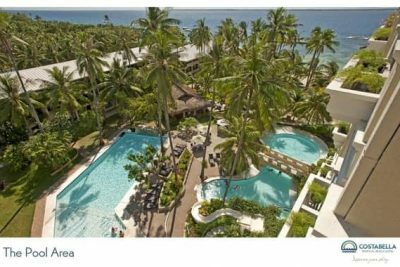 If you plan to spend some time in Cebu, we recommend sleeping in one of Mactan’s luxury resorts for at least a night or two. just 3 hours drive away from Cebu city lies the real gem of the entire Cebu island – Moalboal. It is one of the best snorkeling sites in the Philippines thanks to the Tuble marine sanctuary, and beautiful beaches of Panagsama and white beach – where most resorts are located. Moalboal’s real highlight however, is the nearby Pescador island – an uninhabited island where giant shoals of sardines can be found, as well as sea turtles, thresher sharks, mackerels and dolphins who come there for free lunch. Unlike the more famous sardine-run of South-Africa, Moalboal’s sardines aren’t temporary visitors. They stay here all year long. While it’s possible to visit Moalboal in a single day, spending a night or 2 is the better choice. 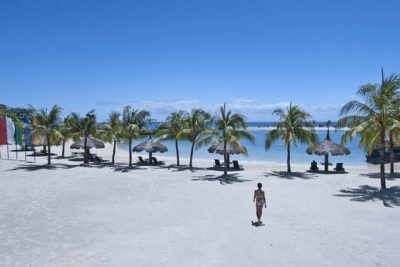 Some of the best beaches on Cebu island, coupled with a quiet atmosphere make it one of the best locations in Cebu. Thanks to its proximity to Badian, we recommend combining both into your itinerary by sleeping in Moalboal and taking a day tour directly from there. Read our Moalboal page for more detailed information and booking options. Badian is only 2.5 hours drive from Cebu city and offers some great spots for nature lovers. 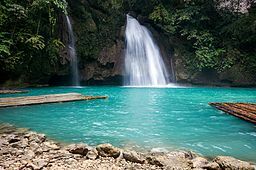 It is home to Kawasan Falls – a 3-tiered waterfall of natural spring-water cascading through turquoise pools below – perfect for fun and relaxation with family and friends. For those who love more adventure, we recommend trekking to Cebu’s highest point, Ösmena peak, and going down to the waterfalls from there. Another exciting way of reaching Kawasan falls is taking a canyoneering tour through the Matutinao river, which flows all the way to the falls through a secluded canyon. This tour will also take approximately 5 hours, and is guaranteed to get your adrenaline flowing. All tours in Badian are available for people staying in Cebu city, but are much easily done if you choose to book an hotel in Moalboal instead. Beautiful Malapascua island should be a part of any diving package, since it is one of the best diving spots in the world. The island has a couple of shipwrecks to explore, and you are guaranteed to have a thrilling encounter with thresher sharks and manta rays, seahorses and much more. From Cebu City it’ll take you roughly 5-6 hours to reach Malapascua – you have to take a bus to Maya and then a ferry. For that reason, visiting the island requires spending at least a night there. Most hotels are found in Bounty Beach – but don’t expect any luxury resorts there. This place is best suited for diving enthusiasts, but couples who seek a quiet getaway would also enjoy it. We also organize private vans, which can reduce travel time to around 4 hours instead. If you are looking for an adventure off the beaten path, at one of the world’s best diving sites, consider taking the trip to Malapascua. This place strikes a nice balance between remote island experience and a tourist friendly environment. Read our full guide to Malapascua Island to find the best hotels and activities there, and decide if it’s something which could enhance your Cebu vacation. 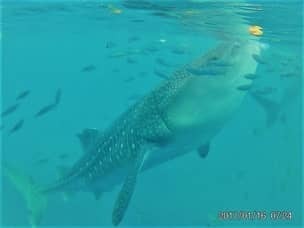 After much consideration and extensive research, we have decided we will not be promoting the Oslob whale shark tour package any longer. The reason is the way the tour is operated is extremely damaging to the environment and to sustainable tourism as well. It wasn’t an easy choice for us, since the Oslob tour is one of the most popular products for tourists visiting Cebu. However, we can’t in good consciousness be a part of the crime against nature taking place there. We don’t intend to judge, and if you want to take the tour anyway that’s of course fine. We’ll help you get to and from Oslob, but will not help with booking the whale sharks tour itself. All we ask is that you first read our guide about Oslob, so you can at least make an informed decision. Oslob is 3.5-4 hours by bus from the city, so everything can be done in a single day. It will however, result in a really packed itinerary and is not recommended. Since the whale watching is best done very early in the morning (6AM), the best idea is to spend a single night there or take the day tour from Moalboal instead (1.5-2 hours drive). Alternatively, you can just take a night bus from Cebu and arrive to Oslob in the morning, before touring the area for the whole day. Oslob is also a great stopping point if you are planning to visit Dumaguete later on. Even though it’s located on Cebu island, it’s actually a bit closer to Negros – so it’s a perfect inclusion in an itinerary of the whole Visayas area. Apart from the whale shark watching, there are other nice attractions there such as Tumalog falls and the nearby island of Sumilon, where you can do some jungle trekking or relax at the beach. If you are staying on Cebu Island and wish to explore nearby locations for just a single day, there are a few really exciting options. The most famous attraction is the Chocolate hills in Bohol. If you take the fastcraft from Cebu City, you can be there in less than an hour, and have the whole day to explore this unique place. We offer guided tours leaving daily from Cebu to Bohol. You can either join a group tour, or hire a private guide and build your own itinerary according to your specific liking. There’s a lot to see at Bohol, so staying 2-3 nights is ideal, but you can definitely squeeze at least a few attractions into a day tour, and get a decent taste of what this place is all about. There’s also no shortage of other great hiking spots in Cebu island. Each offers great opportunities to discover the beauty of nature and enjoy magnificent scenery. Most of these spots are perfectly safe to do on your own, especially if you have some experience in trekking. in any case, it’s strongly recommended you add them to your Cebu package instead, and allow us to take care of everything. Our local guides can provide a lot of valuable insights that will enhance your trip, while also making sure you stay safe. for more information about hiking in the Philippines, you can also check our hiking packages page. We also suggest dropping by Camotes islands, a group of 4 small islands located 2-3 hours away east of Cebu. There are very few resorts in the area, but you can still find good, cheap accommodation. Camotes has some of the best landscape in the area, and is a great place to relax. Limited time offer : Rates as low as 100 USD a day per person! This is one of our most best selling packages, since the two destinations or so close to one and another. Both are extremely popular tourist spots and since they offer different style of attractions, they compliment each other nicely. Bohol has a nicer beach than Cebu, and some of the beach resorts are all world class. Cebu on the other hand has better nightlife, shopping and overall much more things to do. For a complete overview of everything we offer in Bohol, check out our Bohol packages here. Both of these islands are very diverse in terms of the attractions they offer. That is why a visit to both is highly recommended and we feature it as part of both our family vacation packages and our romantic honeymoon packages as well. We will help you customize the trip as much as needed, but it’s truly a holiday any type of traveler could enjoy. It is also very possible to visit Bohol as a day tour from Cebu. This is a good option for those of you who don’t have much time and want to stay at a single island but are still curious to see what Bohol has to offer. Since the ferry only takes 2 hours, you can get almost a full day of activities before heading back to your resort in Mactan. All you have to do is book any of our Cebu packages, and tell our agents you’d like to include this day trip in it. How does Cebu fit into your travel plan? Cebu is one of the largest and most diverse provinces in the Philippines, and a cornerstone of every dream vacation. You can go to different destinations from Cebu so we suggest you include it as part of a much more comprehensive vacation package. By using our services, you can create your entire travel plan, and customize it to your personal requirements. We are confident that we can plan the perfect itinerary for your Cebu vacation. Once you have added all desired items into your cart, simply click the ‘book now’ button and confirm your reservation. Our experts will then review your order, and offer their advice before any actual payment is made. Leave the planning to us and we will ensure that you make the most out of your time here. I would like to inquire about your tour package. Im looking for affordable prices. Thanks! Whats your suggestion also? We already booked a ticket and the only problem is our hotels and tours. Let me know. Thank you! Thank you for leaving a comment and showing an interest in our services. I’m afraid i can’t make good suggestions without knowing even the most basic information such as how many people are you and what are your travel dates. Please fill in our inquiry form and an agent will get back to with a quote. Hi good day, I would like to know about the price of your tour package for 4person for 1week. Please leave an inquiry at our contact page. We would love to help you out but can’t give a price unless you provide some more information.